When I went to Joslin last week, I talked with my doctor about Dexcom sites as well. I told her how I have scar tissue on my arms from all the shots as a kid, but that I thought I read a CGM can still be used through scar tissue because there is no absorption happening. Her first question: “Is it approved for arms?” I explained, that no it is not approved for arms, but I do know a lot of people have had success with it. I also explained how I’m only 26 years old and I plan on being around for a LONG time and I’ve already lost valuable insulin real estate. After mulling it over she told me I could give it a shot, (ha! pun NOT intended) and see how it goes, but it might not work as well. Now I have made no attempt at hiding how freaked out I get when I need to insert a new Dexom sensor. The plunger is just so __________ big. It’s intimidating. After my doctor’s appointment, I was trying to figure out who I could get to help me with an arm site (cue woe is me! I wish I wasn’t single!). When I realized that Meghan was coming to visit, I knew I had the perfect person. I got out my little book and showed her where the instructions were, and where I wanted the site. And the next thing I knew, it was in. Of course this time I was freaking out since it had happened so fast! But it worked! She got me up and running and off we went! This site was not as accurate as my previous belly sites. I do not know whether this is because of the arm placement or because we were at Country Fest and drinking and eating not healthy food and laughing and and and. I was excited to see how it worked this week during a regular week, but when we got home from the grocery store yesterday, the kids were running around, bumped into a bag on my shoulder, causing it to fall and rip out the site. It was short lived and I want to try to it again, but I’m going to wait until I have some extra sensors in case the same thing happens again. Make sure you use gravity (learned that from Kim’s video) to put in the arm sites. It will feel like you are putting it in upside down but it really is so much easier. I find my arm sites to be the most reliable, legs second, stomach far third. I have never flown with a Dexcom, and I really have no desire to start next Monday. My current site is set to be taken out on Saturday, so I’m hoping to be in a good enough place where I can wait until I get to Florida to re-insert. I am also thinking this would be a good place to try another arm site. So, here is my question for today: Are there calm people who will be around Monday night/Tuesday morning who would want to assist me with an arm insertion? Please? Thank you! My upper thighs on the sides, and around towards the back, where there is some good and copious fatty areas, have been the BEST and most reliable sites for me. 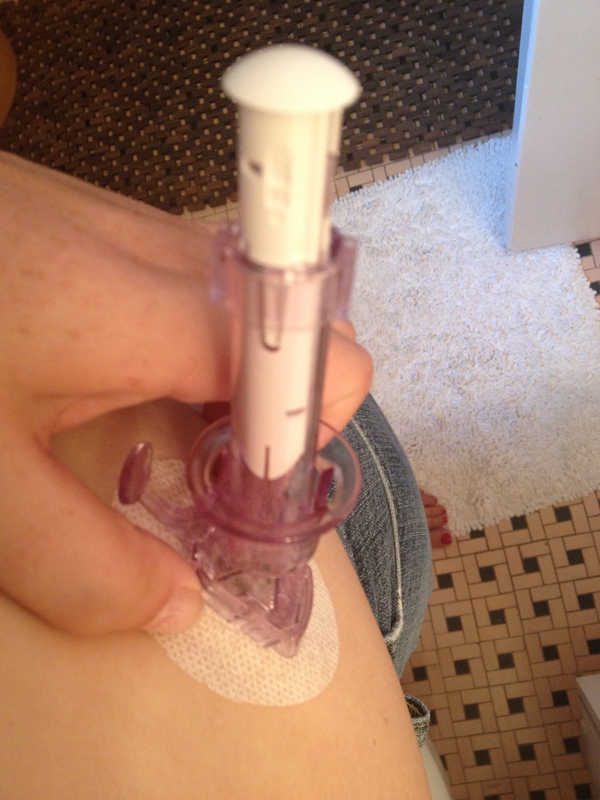 (I use Skin Tac pre-adhering, and then Opsite Flexifix over top in a cross-like pattern to keep the suckers on for 2-3 weeks at a time.) I gave up on my belly areas during pregnancy, and have never gone back. Also, I tended to sleep on my stomach, which inevitably gave me ??? all the time because apparently the sensors don’t like it when you apply pressure to them. Come on, Dexcom, work that out!!! LOVE my arm sites. They are tghe most accurate for me.